Photos by Kurt Lemke. © ©Kurt Lemke 2013; all rights reserved. THE CALIFORNIA EQUINE RETIREMENT FOUNDATION (C.E.R.F.) was founded in 1986 by Grace Belcuore, and the ranch where the horses are kept is located in Winchester, California. One of the first and most well known of the ranch's residents was BEDOUIN, a gelding who retired in 1988 after five years of racing, 67 starts and $311,393 in earnings. He wasn't a great star, just stakes-placed, but he was considered a "bread and butter" racehorse who had become a fan favorite. 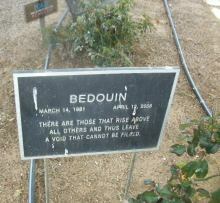 When he died in 2006 as a 25-year-old, his ashes were buried here. 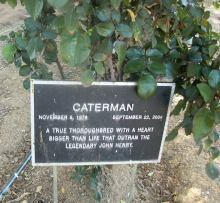 New Zealand-bred CATERMAN, on the other hand, was a talented racehorse who won four stakes races including the Golden Gate Handicap (G3) and earned $648,600 in the U.S. He had been well cared for in his retirement from racing as an eight-year-old in 1984, but when his owner died, he was sent to C.E.R.F. as a 28-year-old in 2002. He lived another two years here. C.E.R.F. horses are cremated and their ashes are buried at the farm.--A.P.